Brian and I LOVE to travel. Absolutely adore it. Unfortunately, let's be honest, traveling is very expensive. And, so is cancer, so we don't get to do nearly as much of it as we'd like. This past weekend, we made the short little trip to Austin. My cousin got married on Saturday night, under the hot July sun. I think that might have been the first outdoor wedding that I've ever attended. Strange. It was a beautiful, but sweltering, setting. 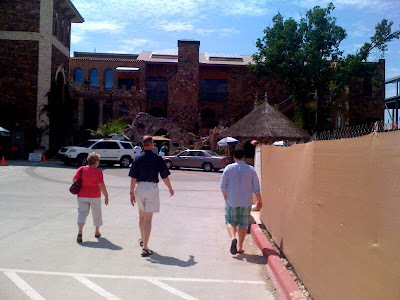 We were able to spend a good amount of time with my parents, who treated us to several tasty meals and a wonderful hotel stay. Parents are great, and it was nice to visit with them without the usual hastiness of life. Then, on Saturday night, after the wedding, Brian and I went to my aunt and uncle's house to spend a couple of days with them. They have lived in Austin for more than 30 years, and they know their city frontwards and backwards. I just love riding around with them because they can tell you all the quirky little things about the place. And, there are plenty of quirky things. We were able to attend church with them on Sunday morning, and I must say, they are a part of the sweetest group of people. Their Sunday School class just really knows how to love and support and care for people. It's truly an incredible experience to be in their presence. They have faithfully prayed for Brian and me for the past 2 years, and rarely a week goes by that we don't get some sort of encouragement from someone in the group. They are a Spirt-led bunch, and it was an immense blessing to finally meet them in person. Kay was so careful to ensure that she met all of my crazy dietary needs in her meal planning. She treated us to a delicious lunch of soup and salads and rice pudding! It was wonderful! Lake Travis is so beautiful. The hilliness and rockiness just make for a breathtaking landscape! 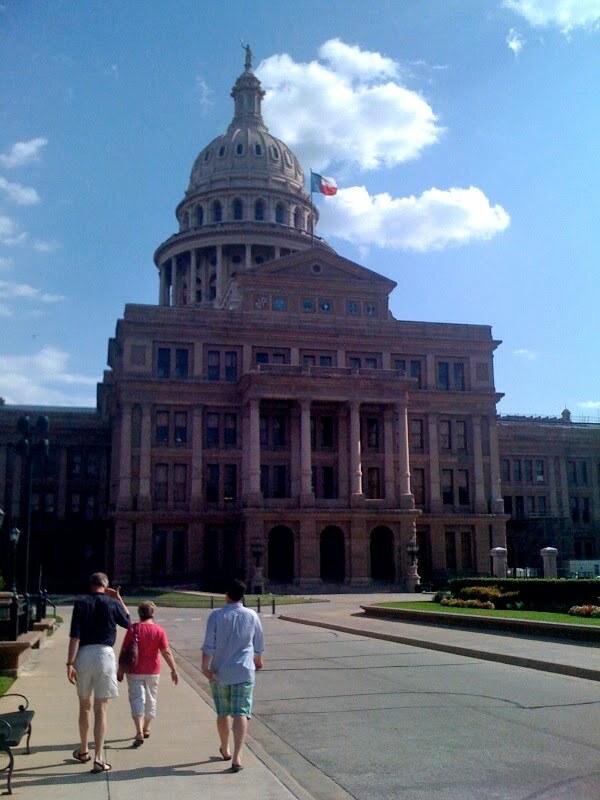 Next, we headed to the Texas Capitol Building. It was open, but not crowded in the least. That made for a wonderful combination for Brian and me, since we despise crowds. I had been to the Capitol before, but Brian had not. It is so fun to walk around and observe a place of such history and relevance. We were so impressed with the new additions to the building. They were lovely, and it didn't, at all, detract from the original design. Next, we headed to the very large Whole Foods store in downtown Austin. 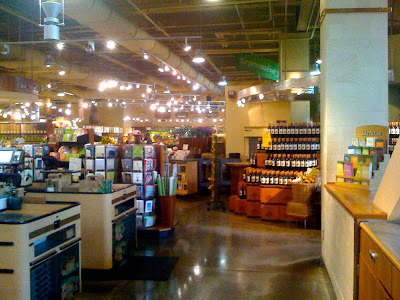 This was, by far, the largest Whole Foods that I've ever seen. It was WAY bigger than the DFW versions that I'm use to. First, we ate dinner at a nice little BBQ stand. It was very tasty! Inside the store, there are about 8 or 9 different counters of food, all with different fare, ranging from BBQ to Italian to deli to seafood, etc. The nice thing was that the meat was organic, so I could eat it! We rarely eat meat, so it was a big treat! After eating, we loaded up on a few specialty items that we can't get in our city, and we quickly rushed to the checkout line, before we totally broke the bank. There is nothing cheap about Whole Foods. 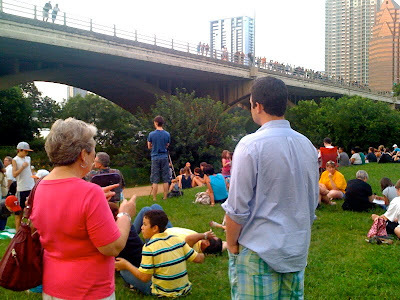 After Whole Foods, we went to see the bats make their nighttime exit from under the bridge. You can read about it here. Unfortunately, after much waiting, the bats never came out. There were several theories about them having babies to feed, but for whatever reason, it got dark and they were still hanging out under the bridge. A bit disappointing. What a wonderful weekend away! It just made me eager for more opportunities to get away with Brian. Going out of town is magical. I just love it! Do you remember Meredith Mattocks? She calls Whole Foods "Whole Paycheck." Cracks me up! That's the original Whole Foods, you know (at least if you went to the one on 6th and Lamar, it is). I remember when it was kind of new-ish. Austin is pretty much my favorite place on Earth...if Tom was up for it, I'd move back. :) So glad you enjoyed! 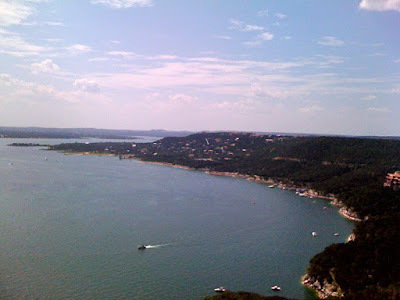 I love living close to Austin without actually living there. The traffic makes me batty, but it's nice that it's only a 45 minute drive away. It is always full of fun things to do. Glad you had a good time. By the way the cake stand came in today and it is too cute. Thanks.